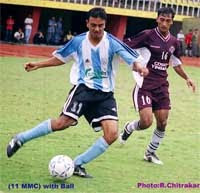 Those who follow Rangasala Blog know that I have been quite complimentary of Nepali Sports Journalists lately. There have been a host of wonderful human interest sports stories in the press recently. The latest is a fantastic article by Pratichya Dulal. However one thing Nepali sports pieces sorely lack is wit and creativity. Reading Nepali sports articles is the equivalent of swallowing sleeping pills. We hardly ever see the headlines, nicknames, drama and humor that makes reading British and American sports articles so enjoyable. Sports editors and journalist in Nepal really need to add some masala to their work - create interesting storylines, develop an aura around athletes, give readers a reason to smile. I give credit to Bikram Thapa, the editor of Goalnepal.com, as his website is one of the few media outlets that lets loose. From silly phrases ("Lemon Break", "Peep! ", "Smell a Rat"), to quirky lines ("600 seconds gone in the match"), to witty nicknames (APF=Gunners, NRT=Road Runners), Goalnepal.com is an entertaining destination. Other publications need to follow suit. 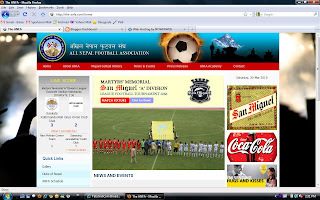 During my school days in the USA I dreamed of the day ANFA would launch an official website so that I and those like me could easily follow Nepali football. Well over a decade later my dream has finally come true and it has turned out to be a nightmare. Last week Three Star Club launched their official website. 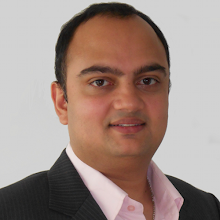 I was curious to see who designed it and that took me to the website of Longtail E-Media. On their site I noticed a screen-shot of what looked like ANFA's website. I presumed that Longtail were designing the ANFA site and sent an email asking them when it would be launched. To my surprise, I received a reply stating that the ANFA website had been up and running for over a year! The fact that a Nepal football jihadist like myself had no clue the site existed just begins to tell the story of what is wrong with the ANFA website. Besides never properly publicizing it (were they ashamed of it? ), the website is hardly updated, filled with spelling and grammar mistakes, several pages remain empty and the "Nepal Football History" section is a cut and paste from Wikipedia. I could go on, but I know no one at ANFA really gives a damn, so no point wasting anymore bandwidth on this topic. As you can see by all the links on the left side column, Nepali sports' presence on the World Wide Web is steadily growing. Nowhere is this more apparent than on Facebook. To give you an idea - on Facebook I am a member of 20 pages or groups, and friends with around 200 people related to sports in Nepal. The entities that I follow include clubs (Three Star, Machhindra), websites (Cricket Nepal, GoalNepal.com) athletes (Deepak Bista, Hari Khadka), sports journalists (Binod Pandey, Niranjan Rajbanshi) and fans. If you are a Nepali sports lover, you really need to join Facebook. It is great place to not only get news and information, but to feel the pulse of Nepali sports. On the Three Star Club page you can witness the frustration of their fans with their poor start to the season. There is another page that chastises Cricket Association of Nepal's player selections. There was even a public tiff between a newspaper and a sports photographer. Facebook is a boon for Nepali sports in another important way. As the Nepali sports fraternity continues to be active on the Internet it will link them with the broader sports world, providing them with much needed sports knowledge, networks and role models. For example, already many Nepalis are following Shillong Lajong FC through Facebook because of Anil Gurung, the club’s Nepali striker. 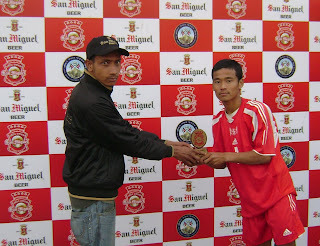 As they continue to monitor the endeavors of a progressive club like Shillong, undoubtedly a few Nepali sports persons will pick-up some ideas and implement them domestically, thus helping raise sports standards in the country. As a side - a lot of the blurbs and links I used to post on this blog, I now only post on Facebook and Twitter. 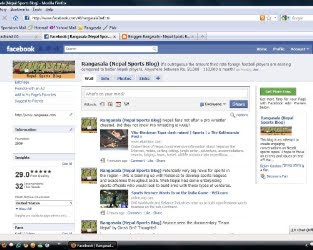 So be sure to follow Rangasala Blog on those social networks. With 12 clubs and virtually no lightweights (i.e. Bansbari Club, Brigade Boys) this is the fiercest league in memory. Any team can win on any given day. Many might point to the exodus of star players from the big clubs as to the reason why, but even the less fancied clubs like Machhindra and Jawlakhel have had to completely reload their rosters. Hopefully ANFA will leave the number of teams at 12 or reduce it further to ensure a strong level of play. There just is not the need or enough talent for more teams in the top flight. Crowds have been disappointing, but perhaps it is a reflection of Nepal today. With constant bandhs, security issues, and chaotic transportation system – people are just not willing to make an effort to attend matches. Having games everyday kills the novelty of going to the stadium, but with the AFC Presidents Cup looming ANFA has little choice but to conclude the league as quickly as possible. With so many players leaving Nepal for opportunities abroad, a lot of new players have had to fill the holes. Most of them are settling in quite well. It proves that there really is not much difference in the standard of players across the country. In a way it is an indictment on our top players who still take an amateur approach to their careers, thus they are only marginally better than the rest of the pack. Have they done anything to really develop themselves? They continue to treat football as a hobby. Their lack of professionalism is highlighted by MMC replacing their famous sky blue and white striped jerseys (see photo below left) with a bland blue shirt they found at the Adidas store (see photo below right). If they can’t even get their club colors right, how can we expect bigger things from them? Update: MMC have gone back to playing with their traditional kits. Hurray!